The photo above is an 18" specimen. I took this photo in the middle of a yawn (the catfish, not me). I was a great fan of keeping these large catfish until I visited the Tennessee Aquarium in Chatanooga, USA. They had an enormous Amazon species tank which is pictured in the photo on the right. 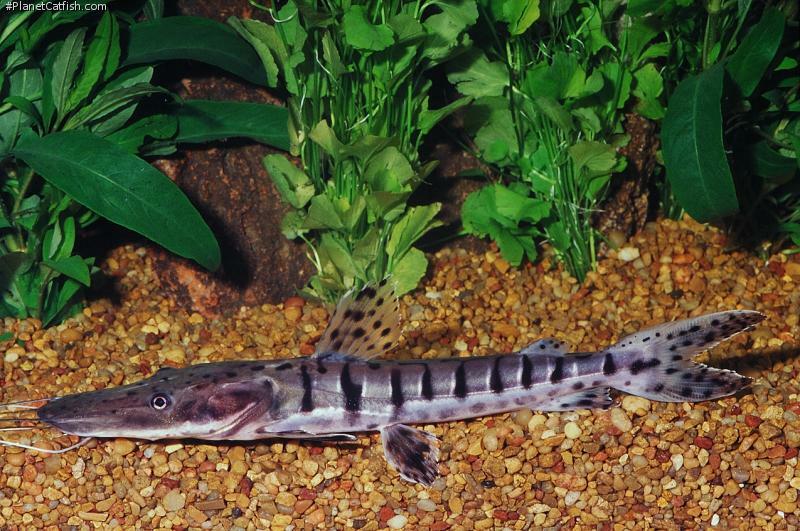 The tank was inhabited by, amongst others, the pictured tiger shovelnose, an adult red-tailed catfish, shoals of oscars (which were the smallest fish in the tank! ), eye spot cichlids (Cichla ocellaris) and arrowana. To see a full-grown Tiger shovelnose cruising effortlessly without havng to turn round every 3 seconds made up my mind about keeping these and some other large catfish in anything smaller than a big pond. I remain a great fan.". Size 1050mm or 41.3" SL. Find near, nearer or same sized spp. Identification Vertical to slightly oblique black stripes; often has spots, which are thicker on the ventral side; great variation in stripe and spot patterns. Eigenmann recognized at least 14 varieties or subspecies based on colour patterns; easily confused with other members of the genus. Feeding Fish, crustaceans and literally anything that it finds tasty and small enough to eat. I have personally witnessed one of the fish pictured above eat a large freshwater stingray head first! Furniture Large secured pieces of bogwood and rock. Compatibility Will eat anything that isn't big enough to avoid being on the menu. There are 63 registered keepers, view all "my cats" data.